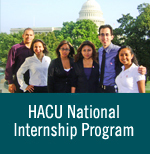 The Hispanic Association of Colleges and Universities will offer a free webinar for students on “How to Prepare a Competitive Graduate School Application,” October 31, 2018, 2:00 – 3:00 p.m. CDT. | Register here. The webinar will focus on providing information on key aspects that make an application for graduate school competitive. The panelists from the University of Pennsylvania will discuss best practices and what they look for in personal statements/statements of purpose, letters of recommendation, how standardize test scores are evaluated, how work experience may factor into the overall competitiveness of the application, the pros and cons of applying directly to a graduate program immediately following undergraduate study.